While there's a plethora of styles and fashions for every living room, kitchen or bedroom, bathrooms tend to suffer from a degree of uniformity. As dedicated to hygiene as they are, your average bathroom doesn't afford much of its design to quirky or eclectic style. But that's no reason to give up on your bathroom's eccentric side. Consider some of these quirky storage options to give your home's commode more character while multiplying its efficiency. 1. Hidden medicine cabinets. We all know that a mansion's most valuable jewels are hidden in a safe, which is itself hidden behind a priceless work of art. Why not take this caper movie trope into your bathroom with a medicine cabinet that doubles as a favorite painting? While paper doesn't traditionally stand up well in a moist space, grab a favorite print and slot it inside a medicine cabinet's mirrored frame, then affix it wherever's stylish. 2. Hanging baskets. Many a potted plant has been hung from the ceiling, sometimes in stylish wire baskets. Why not nix the plant and use this lofty locale to store other items? Seasonal affectations such as pumpkins and gourds during the fall or snowman figurines during the winter could be a great choice. Or, if you're particularly tall or the basket is low-hanging, why not keep a few shower items in it? Then again, using it for houseplants isn't a bad idea either, as a little green will improve air quality in your bathroom exponentially. 3. Filing boxes. ApartmentTherapy.com has a great tip for those with a little surplus of office supplies. Desk-side or cabinet-side storage units are slim and stylish ways to store everything from your hair straightener to some of your favorite reading materials. Just mount these mesh-style filing boxes on any fixture, from your vanity or wall to the back of your bathroom door. 4. Toy boxes. Have a snazzy wooden toy box that your kids have outgrown? Why not give it a fresh coat of paint and let it double as a bench and towel storage in your bath? 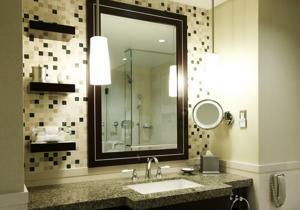 While not all bathrooms will have the space, this can be a stylish opportunity for those that do. You can always use it as a stepping stool for when you need to water your hanging plant!